Super Services, is an ISO 9001: 2008 certified company, a Multi Brand Reparing Center. Our experienced, courteous and highly professional engineers are renowned for providing customers with a full range of appliances repair work, carried out to the highest standards. Whether it is Microwave Oven that won’t heat or Washing Machines that won’t spin our fully trained engineers will have your appliance fixed quickly at competitive rates. 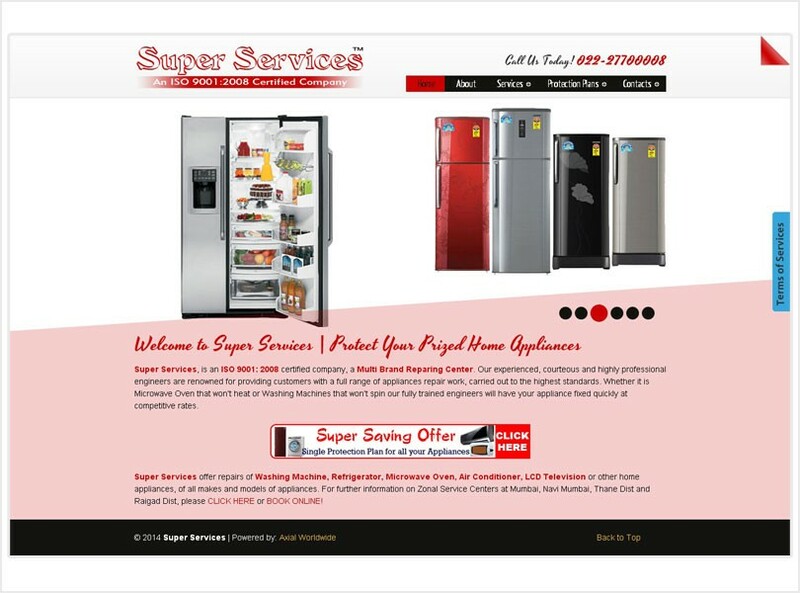 Super Services offer repairs of Washing Machine, Refrigerator, Microwave Oven, Air Conditioner, LCD Television or other home appliances, of all makes and models of appliances. For further information on Zonal Service Centers at Mumbai, Navi Mumbai, Thane Dist and Raigad Dist. Super Services, is an ISO 9001: 2008 certified company, a Multi Brand Reparing Center. Our experienced, courteous and highly professional engineers are renowned for providing customers with a full range of appliances repair work, carried out to the highest standards.